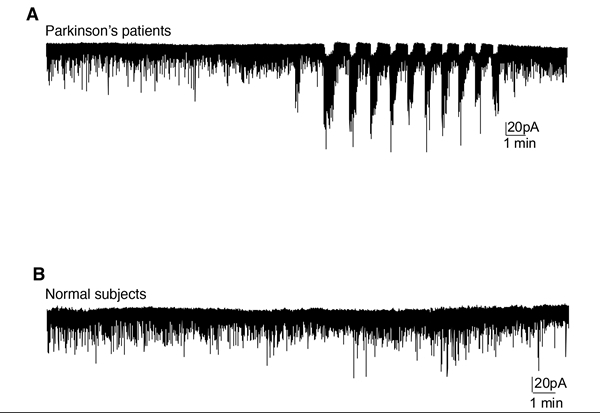 Rhythmic bursting or oscillations of electrical currents measured in nerve cells from Parkinson’s patients, top chart, and no oscillation of electrical currents in nerve cells from normal subjects, bottom chart (University at Buffalo). 3 May 2017. A team from University at Buffalo created brain cells from adult stem cells that in lab tests display the same nerve misfirings seen in people with Parkinson’s disease. Researchers from the university’s medical school describe their findings, which they believe can speed up discovery of new drugs for Parkinson’s disease, in yesterday’s issue of the journal Cell Reports. The Buffalo team, led by physiology and biophysics professor Jian Feng, are seeking better ways of reproducing and simulating the activity of nerve cells in the brain afflicted with Parkinson’s disease, particularly the bursts of repetitive nerve cell signals in people with the disorder. Parkinson’s disease occurs when the brain produces less of the substance dopamine, a neurotransmitter that sends signals from one neuron or nerve cell to another. As the level of dopamine lowers, people with Parkinson’s disease become less able to control their bodily movements and emotions. Symptoms include tremors, i.e. shaking, slowness and rigidity in movements, loss of facial expression, decreased ability to control blinking and swallowing, and in some cases, depression and anxiety. According to Parkinson’s Disease Foundation, some 60,000 new cases of Parkinson’s disease are diagnosed in the U.S. each year, with more than 10 million people worldwide living with the disease. Feng and colleagues recreated Parkinson’s disease in the lab with adult stem cells from the skins of people with the condition, who also have mutations in the gene that encodes the protein parkin. This protein regulates a number of basic cell functions, including the transmission of signals among nerve cells. Feng’s lab discovered earlier, with a similar technique, mutations in that gene interrupt dopamine’s activity in the brain, leading to disruptions in normal muscular movements like those in people with Parkinson’s disease. The team cultured adult stem cells from 3 individuals with parkin gene mutations and 3 people without the mutations for comparison, which required more than 100 days to produce nerve cells in the brain with mature signaling properties. When the researchers recorded electrical activities of these brain cells, they found clear differences in patterns between the two collections, with the parkin mutations showing oscillations in their signals and no oscillations in the comparison cells. When the team rewired the oscillating brain cells with healthy parkin genes delivered by benign lentiviruses, the repetitive signal bursts disappeared. The authors believe this recreation of brain cells with Parkinson’s disease can help better understand the molecular mechanisms behind the disorder and provide a way of testing new treatments. The researchers say they’re in discussions with Q-State Biosciences, a spin-off enterprise from Harvard University, developing processes with stem cells and other technologies to speed up discovery of new drugs. In this case, say the researchers, Q-State is interested in creating a higher-speed version of their model to find new Parkinson’s disease treatments.